Would you like a GodVenture Family Activity Workshop at your church? It’s exciting that across the country families and churches are investing time to develop their faith at home. The workshops are for families to attend together, which many people are not used to, and so it may take a bit of explaining. The workshops are designed so that most of the learning takes play through activities, and even the way it is set up helps to empower and equip families. The set up takes about 2 hours, so I usually do 2 events, one 10am-12 and the other 2-4 pm. These can be identical workshops with different sets of families at each, one with an under 5s focus or they can be run with a smaller gap in between with two different workshops combining to make a faith at home day for one set of families. I charge £400 for the day, plus 50p/mile return from Leamington Spa, and I suggest a ticket price of £10-20 per family. This means that if enough families come, the fee is covered, and the church just pay my travel expenses. I offer tickets to be sold via the host church and on my website. 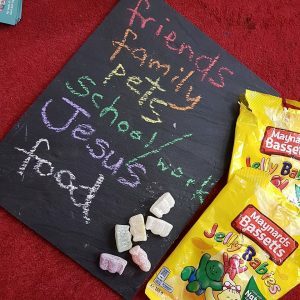 Together Time 1: We will start off with a creative prayer, then play some games to explore faith at home in the Bible and discover some of the things we already do in our homes which help our faith grow. Activity time 1: Time to explore the Bible story using lots of different activities, a chance to find out what suits your family and get some new ideas. Together Time 2: We’ll get together as a group to reflect on what we’ve done and to try out a few creative prayer activities. Activity time 2: More time to explore, this time trying out new ways to pray as a family together. Together Time 3: A final get together, reflect on what we’ve done, a couple more prayer activities and suggestions for where you can get resources. A venue big enough to set up 20-30 stations, room for around 15 families (around 60 people) to do activities, usually a room with a big space to sit on the floor or around tables together. £100 deposit when we’ve agreed a date, and an agreement to cover the remainder of my fee if not enough tickets are sold. Encouragement for people to book tickets either on my website or direct with church. Access to the building 2 hours before the first workshop. Three to four people to help me set up, and another 3-4 to help pack up. If you’re interested in hosting a workshop, but not sure you have enough families in your church, it would be great to have a joint event with other local churches. Do get in touch with any questions or if you would like to discuss potential dates for an event at your church.